Chicago police said a retired officer shot at three men who were attempting to carjack him, killing one of them. Police said the officer, who neighbors said is in his 60's, was either inside his vehicle or near it in the 2900-block of South Shields Avenue shortly before 7:30 when three men approached him and tried to carjack him. 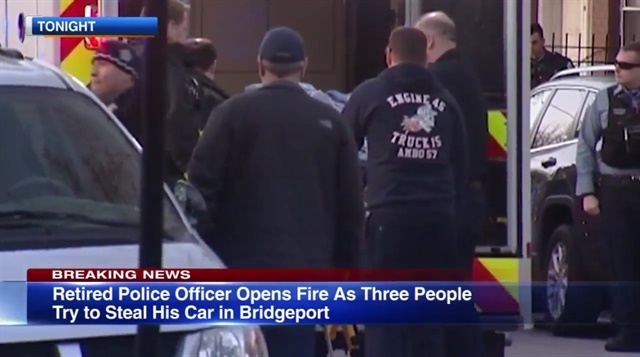 The retired officer opened fire and struck one of the offenders, police said. "The retired Chicago Police officer was able to fire shots, striking the offender in the upper body. The offender was taken to Mercy Hospital [where he died]. The other two suspects were apprehended, and area south detectives are handling the investigation," Sgt. Rocco Alioto said shortly after the shooting, according to ABC7.